There’s nothing better than some warm, fluffy waffles for breakfast. And who says following a keto diet means you have to miss out on this American classic? If you want to start your morning off right, high-protein breakfasts are the way to go. The problem is — high-fat cottage cheese and greek yogurt can get dull, and sometimes you just don’t want eggs and bacon. These high-protein, gluten-free waffles are packed with 17 grams of protein, and only 4 grams net carbs. Top with some grass-fed butter and sugar-free syrup and you won’t even remember you’re on a keto diet. And the best part? This healthy recipe tastes just like the higher carb version — you won’t even know you’re eating low-carb waffles. Have them for breakfast, post-workout, or as an afternoon snack. You can even switch up the protein powder and make chocolate protein waffles. Diet and heart health go hand in hand. And whey protein may promote optimal heart function. Studies on whey protein show that whey can help to regulate blood pressure, lower triglycerides, and improve insulin sensitivity and blood sugar levels[*][*][*]. If you’re looking to shed some extra pounds, trading in carbs for protein is the way to go. Protein not only enhances your satiety, but it also tends to burn more calories as it’s being digested, compared to carbs and fat. Protein –specifically whey protein — also helps you maintain your lean muscle mass[*][*]. Whey protein is a favorite among athletes and gym goers due to its high levels of the amino acid leucine. Leucine is a branched-chain amino acid that has an anabolic effect on your muscles. In other words, it helps to preserve and grow your muscle mass so you can lose weight from fat, without sacrificing muscle mass[*]. Another fantastic source of protein in these waffles comes from eggs. Eggs are considered a “perfect protein,” because they contain all of the essential amino acids your body needs in the perfect ratio[*]. Research shows that when people eat eggs in the morning, they tend to feel more satisfied and eat less later in the day[*][*]. Whey protein is great for supporting weight loss and promoting heart health, but it may also improve your body’s ability to defend against cancer. Whey contains a protein called lactoferrin that’s been researched for its anti-cancer potential. In fact, lactoferrin has been shown to kill off 50 different types of cancer cells in cell studies[*]. Colon cancer, in particular, is estimated to affect 1 in every 20 people in their lifetime. Along with early screening, diet plays a significant role in the prevention of colon cancer. Almonds might help. Animal research has shown that specific properties found in almonds may help decrease the risk of colon cancer, and even fight off colon cancer cells within the body[*][*][*]. If you’re looking for new recipes to satisfy your sweet tooth and your protein needs at the same time, this is the recipe for you. These protein waffles couldn’t be easier to make, and unlike the standard carb-loaded waffles, these will keep you satisfied for hours. So let’s get started. Preheat your waffle iron and coat it with butter or nonstick spray. While your waffle iron is preheating, add all the ingredients into a large bowl and, using your mixing fork, whisk it until all the ingredients are evenly combined. You should have a silky smooth batter. Allow your batter to sit for about five minutes and then pour the batter onto the waffle maker, according to the waffle maker instructions. That’s it! 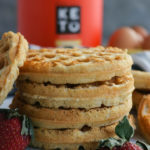 You can top your waffles with monk fruit maple syrup, coconut cream, butter, or some delicious Perfect Keto Nut Butter. This protein waffle recipe fuels your body with complete protein for more energy — and you only need one bowl, a mixing fork, and a waffle iron. Preheat your waffle iron and generously coat with nonstick spray or butter. Add all ingredients to a large bowl and whisk well until smooth. Pour waffle batter onto heated waffle maker and cook until golden brown and crisp on both sides. Top with monk fruit maple syrup, coconut butter, coconut cream, or slather with Perfect Keto Nut Butter.